Kathy, a 54 year old woman staying at the Harvest Home, has a smile that lights up a room. She wasn't always like this, though. It wasn't until going through the Harvest Home's program that she was able to find healing and blossom into the woman she is today. 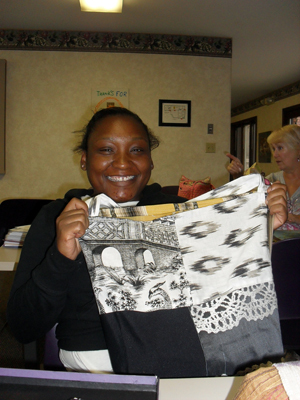 She found purpose and joy through their new program, Lydia's Purse. Lydia's Purse is collaboration between the Harvest Home (a homeless shelter for women and children) and Maryann Wohlwend, Founder of MaryannDesigns and International Director of Lydia's Purse. 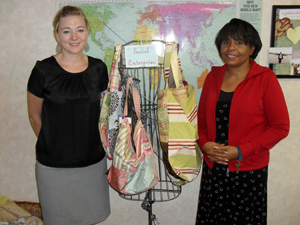 Her slogan "Sewing Handbags while Sowing Hearts" defines this social entrepreneurship empowering women from Northeast Ohio to the ends of the earth (all the way to Tanzenia). Over two years ago Maryann stopped by the mission asking if she could speak to Yvette McMillan, Director of the Women's Division. 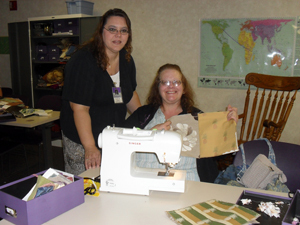 "Maryann showed me some of the purses that she makes from remnant fabric. She shared about her business and vision to set up discipleship and social enterprise classes at shelters to help homeless women develop a skill – something they would be able to use to support themselves," McMillan explained. 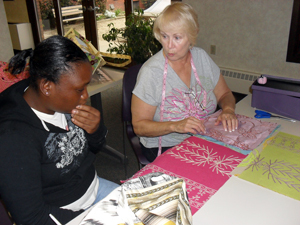 "She usually gets (the fabric) at high end upholstery shops that is outdated or out of season and we sew and sell them," Candace, Social Worker and Case Manager at the Harvest Home added. Many of the women staying at the shelter have extremely low self-esteem due to various life events. Kathy is one who broke free from this. "I took sewing in school. I was left handed and it was a right-handed world. I had to go in front of the class to get lefty scissors," Kathy recalls of feeling like an outcast in 7th grade. "My seams went to the right instead of the left and I was forever rippin' them out. My teacher was very impatient with me and I felt crushed. My spirit of creativity was non-existent and after years that just kind of corrodes your sense of self-worth," she said. "With everything else on top of that over the years I had no sense of self -worth. I didn't think I was creative at all, but after making these purses everyone said I have a good eye for putting materials together. I'm choked up," she said, tears beginning to fall, "It just gives you back what you shouldn't have lost," she said, wiping them away. "The ladies come in, in a crisis situation. A lot is going on and they have no confidence so it's time for re-growth in their self-esteem. We build them up and encourage them," Candace said. Priscilla Smith, a 64 year old volunteer, says a program like this is important because of the fact that it builds the women's confidence. "It gives them so much self-esteem because when they finish their purse they realize 'I made this!' and that is so wonderful. They realize they can do something," Smith said. "It doesn't have to be perfect because there's nobody in this world that is perfect. You want to do your best but if your best has a little flaw then that's all right too. It's ok because there are people with flaws and we still love them," she continued, encouraging the women. "I've heard women say 'I've never completed anything like this before' or 'I didn't know I could make a bag', 'I didn't know I could sew', 'I never thought I was creative'," McMillan shared. She builds them up, telling the women "You're gifted. You are given gifts and talents just like the women who work here. God wants to develop those talents in you and He wants to show you what great plans He has for your life. You're able to do this and be productive and this is the way to provide for yourself and your family." This encouragement inspires the women to push themselves further than they ever dreamed they could go. "It's a wonderful program. You see the creativity and it's wonderful to watch a girl come in with no confidence and she makes her first purse and then starts making all kinds of extra's like little wallets, pockets and things here and there. They build their self-confidence and creativity and to watch that develop is like watching a child grow up," Smith shared. Beginning in February of 2010 at the Harvest Home, God has been using this program to mend women's broken, unraveled hearts ever since. "We've never had this type of collaboration before with a business," McMillan shared. The response they've been getting from the women has been great. "It cleared my mind. If any negative vibes are around me I can get 'em off 'cause I'm here making my bags," Damika, a Harvest Home Resident said. Holding up a special purse sewn with golden fabric, she explained the patterns which reflect her journey at the Harvest Home. "This piece right here is when I first started," she said of a dark piece "This is me doing my own thing." Pointing at another piece of fabric she said "This is me getting closer and on the streets of gold," she smiled enthusiastically about her work of art. Holly, another resident, says this program has been "Wonderful". "It's centered around God and that's what makes it wonderful. Every time I come here I'm excited. I look forward to it all week," she said. Smith, the volunteer mentioned above, has been sewing since she was just a child. 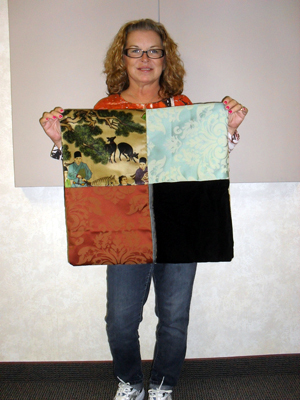 "I learned to sew when I was just a tiny, little girl from a woman we called 'Miss Lucy'," she said. Smith wants to share that love for continuing the sewing tradition. "It's becoming a lost art but if we teach people, especially young women, that everybody needs clothing and draperies, there's always something to be sewn," she said. "I love it because you meet the most darling people and each one of them has a story. Some are heartbreaking, some are just down on their luck and need a helping hand," Smith said. Building relationships is key in this project. "The purpose is for relationships to develop between the volunteer and the woman staying at our shelter," McMillan explained. "They are able to build a friendship and develop their relationship with the Lord with some spiritual mentoring, discipleship and learning scripture verses. That volunteer friendship between the participant in class and the volunteer is key in making Lydia's Purse work," McMillan continued. 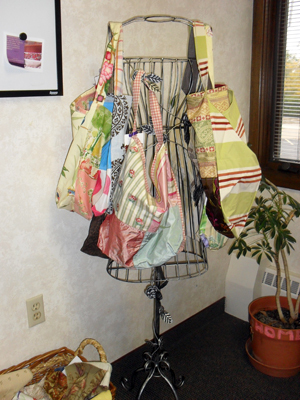 Since this past summer they've been selling their Harvest Hope Totes and Shop Totes at the Hartville Flea Market. One of the greatest advantages of buying one of these lovely purses is the fact that it all goes back to a good cause. Seventy-five percent of what they make goes back into the program. "Many people like the fact that they can buy something that is green. They're made of recycled fabrics. It's also going to help the homeless women and children," Amy Prior, on staff at the Harvest Home, said. Once reaching level four of the program the women work with Maryann who teaches them how to work from their homes to create an income for their families. 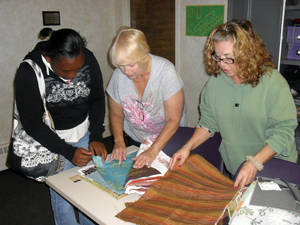 "A lot of women have either moved out or are in the process of obtaining housing or an apartment so they can begin teaching sewing classes if they would like to," Prior said. Upon graduation each woman also gets her own brand new sewing machine. "We encourage them to make things on their own to sell, or some bring them back here for us to sell. It gives them something to do and extra income," Candace said. "And they can start sewing other things," Prior added, such as baby clothes and other essentials. This is helpful for many of the mothers of babies and young children. Plans for the future at the Harvest Home are exciting. The women there aren't afraid to dream big. Eventually they would like it to operate year-round at the Hartville Market, more consistently. "Our dream is that we could employ some of the ladies who went through our program here and they would learn and develop retail skills, marketing, display and customer service," McMillan said. Many of the women have this desire and those at the Harvest Home simply want to provide the avenue for them to do it. "That's our dream," McMillan shared. For more information on Lydia's Purse and/or volunteer opportunities please email Yvette McMillan at the Harvest Home: ymcm12@aol.com. The Harvest Home is also part of the Haven of Rest. You can visit their website at www.havenofrest.org.